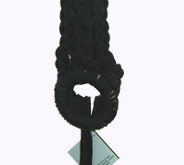 We offer our wide range of fabric belts, that are made from superior quality of fabric. 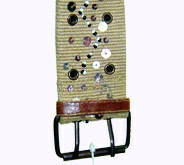 These belts are versatile and can be worn in combination with various outfits. 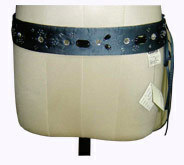 Our fabric belts are available in various sizes, shapes & color combination. Desc : Exquisitely cut in various attractive designs, black colored fabric belt creates a glamorous effect in every ceremony with its designer look. Desc : Fabricated from pure silk, women's silk belts having yellow, purple & blue check patterns and stylish buckle glamorize the personality of beauty conscious girls & women. Desc : Hand crafted in an exclusive look, this elegant casual fabric belt in black shade can be fastened around the waist delicately and bewitchingly. 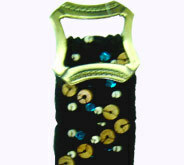 Desc : Prettified with engaging sequins & stones of different sizes & colors, wide sized fashion fabric belts improve the fascination of wearers in an unmatched way. 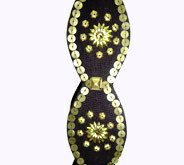 Desc : Golden & blue colored sequins of various sizes are sewn on black fabric to jazz up these sequin belts amazingly. 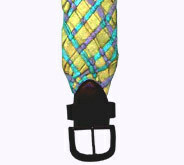 Dexterously carved buckle also illuminates them. Desc : Garnished with stitched sequins in beautiful designs, black colored ladies fabric belts add a dash of appeal to the garments of wearers.